Browse our marvellous collection of mint recipes, including Marcus Wareing's mint bon-bons, Geoffrey Smeddle's mint and lime scallop carpaccio and Galton Blackiston's wild sea bass with pea and mint soup. Mint recipes are all about keeping cool. Sweet and fresh, there's no mistaking the pleasant scent of mint, which has wide range of culinary uses in both sweet and savoury recipes. Mint comes in several varieties, with spearmint most commonly used in cooking, but you'll sometimes find peppermint used in sweet recipes, too. Mint combines exceptionally well with many vegetables, particularly potatoes and peas. See how Shaun Rankin brings them both together in his minted potatoes recipe, aptly served with roast leg of lamb. Or try Galton Blackston's minted new potatoes, boldly served with bacon, samphire and broad beans. On the sweet side, Galton Blackiston's mint ice cream makes for a beautiful and surprising dessert. Mint also works well with berries, as in Shaun Rankin's blackberry and mint compote for vanilla cheesecake, and Tom Aikens' poached strawberries with mint and Champagne. Mint is lovely picked right off the bush, but it can also be purchased freeze-dried, convenient for dishes that require very little or no cooking such as salad dressings. 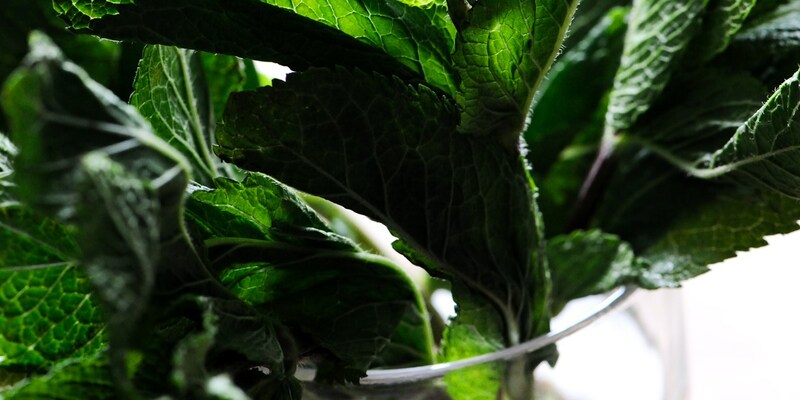 Dried mint is also useful for making herbal tea.